#3DPM - 3D Printing Network Manchester: #3DPM & Ultimaker - CREATE together! Ultimaker GB has launched a 3D printing initiative for schools in Britain. Like the 3D Printing Network, Ultimaker has very strong ideals which they live by. Like being open source, sharing and collaborating. Like us, Ultimaker has an urge to bring 3D Printing to schools. Ultimaker wants to get kids in touch with this new innovative technology and ignite that creative flame we all had at that age. Ultimaker has already been working with education institutions in the UK and with schools on the continent to great success and is now about to officially launch into the Education sector. A national campaign called CREATE Education Project is being rolled out as 2014 starts, with schools eager to provide students the best current learning opportunities 3D printing has to offer. Ultimaker’s CREATE initiative has received fantastic feedback from teachers and pupils have been blown away by how easy the Ultimaker technology is to use and the subsequent opportunities it presents! Collaborative learning is the way to go! By bringing people together and sharing our understanding, breakthroughs in learning will be abundant. Ultimaker already has a thriving community, we want to extend to include you! And support. Ultimaker has a reputation of being one of the most reliable 3D printers available. We believe that 3D printing is going to impact many key areas in the future, whether it’s prototyping in manufacturing, bespoke replacement joints in medicine, scaled models in architecture or the latest trend in fashion, 3D printing is integral to learning and development and changes the game in design realization. The Cura software that is open source and free to Ultimaker users, allows an abundance of design software / scanners downloaded templates to be printed accurately in 3D. It is made to be user friendly so without any prior knowledge you can dive right into 3D printing! We all know that the best way to show a clear understanding of a concept is to teach it to someone else! Our design approach encourages individuals to experiment independently and then share their progress with others. 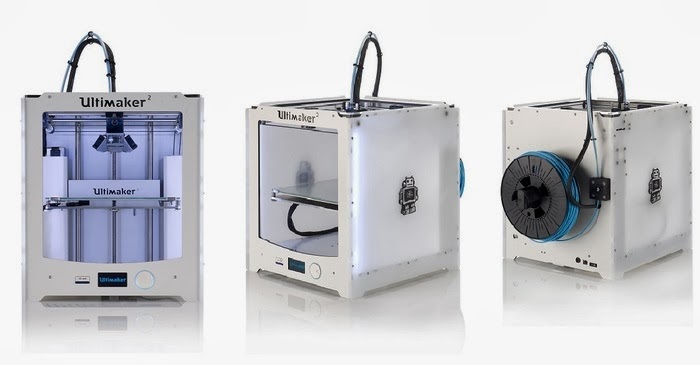 Ultimaker is already one of the most affordable options on the market, the kit version starts at an amazing £1000! Education institutes cannot afford to be denying students the chance to change the world. 3D Printing Network will be bringing you Ultimaker 3D printers and 'build your own printer' workshops soon, so watch this space!